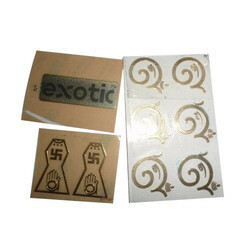 We are a leading Wholesaler of metal logo stickers and ep stickers from Delhi, India. Being a customer-focused organization, we are engaged in offeringDecorative Aluminium Label. These labels can be availed by the customers in different sizes, shapes and colors to meet their requirements. Customization of these labels are offered by us to meet the needs of customers. We offer these labels to the customers at industry-leading prices. We are the most trusted name amongst the topmost companies in this business instrumental in presenting EP Stickers.